Would you pass this grammar test that 8th graders were given in 1912? I'm not sure that I would. :) They really knew their stuff! Take the test and see for yourself. You'll find the answers below. 1. How many parts of speech are there? Define each. 2. Define proper noun; common noun. Name the properties of a noun. 3. What is a personal pronoun? Decline I. 4. What properties have verbs? 5. "William struck James." Change the voice of the verb. 6. Adjectives have how many degrees of comparison? Compare good; wise; beautiful. 7. 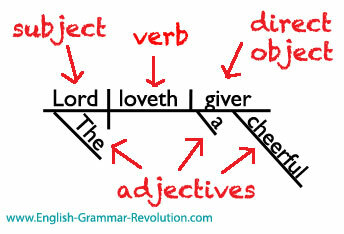 Diagram: The Lord loveth a cheerful giver. 8. Parse all the words in the following sentences: John ran over the bridge. Helen's parents love her. 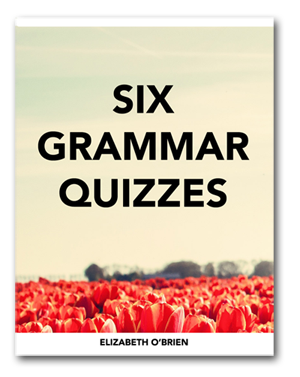 This grammar section is just one of the subjects that 8th graders were tested on. You can see the rest of the test here. I don't have an official copy of the answers for this test, but I do know grammar, so here are my unofficial answers. Learn about the eight parts of speech here. There are eight parts of speech. 1. Nouns name people, places, things, or ideas. 2. Pronouns take the place of nouns. 3. Adjectives describe nouns and pronouns. 4. Verbs name actions or states of being. 5. Adverbs modify verbs, adjectives, and other adverbs. 6. Prepositions show the relationship between a noun or a pronoun and some other word in the rest of the sentence. 7. Conjunctions join two or more words, phrases, or clauses. 8. Interjections show excitement or emotion. They are not grammatically related to the rest of the sentence. Properties is referring to what characteristics or attributes nouns have. Proper nouns name specific people, places, things, or ideas. Common nouns name non-specific people, places, things, or ideas. Learn about common nouns and proper nouns here. Personal pronouns take the place of common and proper nouns. Nouns, pronouns, and adjectives have different forms depending on the number, case, and gender of the word. Decline means to state these different forms. Personal pronouns have three modified forms based on the purpose that the pronoun has in the sentence. I ate pancakes for breakfast. The brown dog is mine. Isn't this question worded in an interesting way? Properties here is referring to what characteristics or attributes verbs have. Learn about verb tenses here. Change the voice of the verb. This sentence is written in the active voice. This means that the subject is performing the action. Changing the voice means changing this sentence into the passive voice. After we do that, the subject will be acted upon. 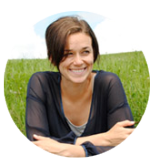 You can learn about active voice and passive voice here. That sentence is in the active voice. James was struck by William. That sentence is in the passive voice. 6. Adjectives have how many degrees of comparison? Learn about comparative & superlative adjectives here. Adjectives (and adverbs) can have different degrees. That means that things can have more or less of an adjective's quality. Adjectives (and adverbs) have three forms, but only two of them show comparison. The positive form of an adjective is the one we use when we are not comparing things. We use comparative forms when we are comparing two things. The weather in Tahiti is hotter than the weather in California. We use superlative forms when we are comparing three or more things. The Sahara Desert's weather is the hottest. The Lord loveth a cheerful giver. Sentence diagrams show you how the words in a sentence are related to each other. They are pretty cool. 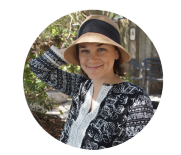 Learn more about diagramming sentences here. 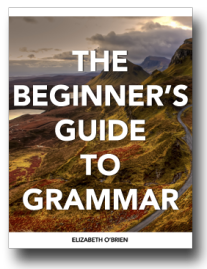 Parsing means analyzing a sentence word by word, and it used to be the main way to test a student's knowledge of grammar. 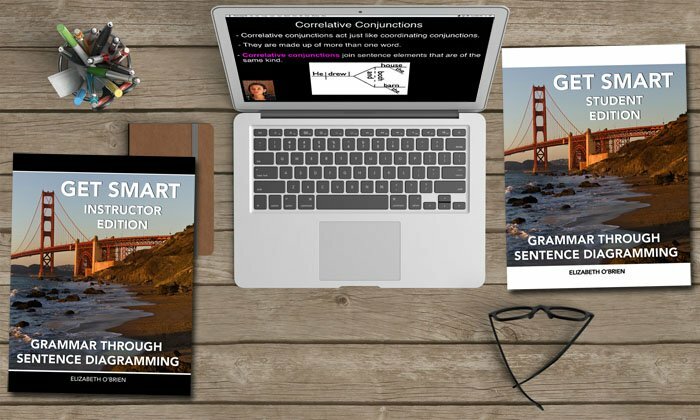 When sentence diagramming was introduced, teachers saw it as a major time-saver! John ran over the bridge. John is a proper noun. It is the subject of the sentence. Ran is an intransitive verb. Over the bridge is a prepositional phrase modifying the verb. It answers the question, "Where did John run?" Over is a preposition; bridge is the object of the preposition, and the is an adjective telling us which bridge. Parents is a common noun. It is the subject of the sentence. Helen's is a possessive noun functioning as an adjective modifying parents. Love is a transitive verb. Her is an objective pronoun. It is the direct object of the verb love. I'm a recent college graduate who never learned sentence diagramming in school, but I decided to try my hand at it as a way to improve my writing. It definitely changes the way that I see our language, and it has proven an invaluable groundwork for learning more abstract techniques of writing effectively. How did it go? I hope you had fun taking a peek into the past!